Cannot live without. That's a big claim, I know. In this case, it is probably true. Now, I change up my skin care routine quite often, but these products always keep their place as my trusty helpers. Clarins Blue Orchid Face Treatment Oil (€40.00) - I use this once a week - or more, depending on the state of my skin - to give my skin a moisture boost, as this particular one is focused on dehydrated skin. The morning after, I always wake up with plumped skin. Nivea Night Cream (€5.50) - I know, so random. But, I go through these very quickly as I like to apply a generous amount at night. This cream is really thick and so moisturizing. I've used other night creams, but I always come back to this one: it is affordable, does the job and does not break me out. Bio Oil (€9.43) - I swear by this. I've used it for acne scars, mosquito bites, stretch marks on my thighs, and general dry patches. It solves them all. However, you need to keep in mind that your skin takes time to heal. The packaging advises to apply 2 times a day for at least 3 months. When you do this, you will notice a dramatic difference after about a month and a half. 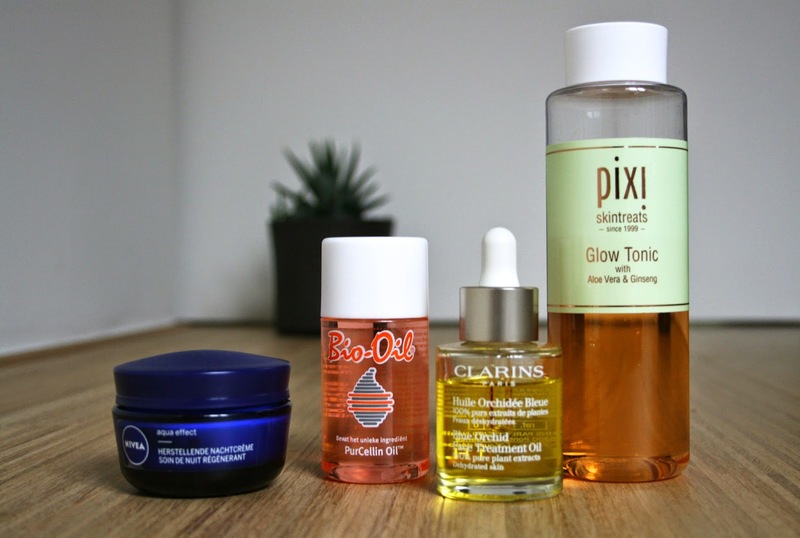 Pixi Glow Tonic (€20.00) - Where to start? When I first got this I used it daily. For some reason, I stopped using it. Then, because of stress - cheers, university - my skin started to act up. My skin got better after about a week of using this. So, Pixi Glow Tonic, you are never leaving my side again. So there you go, my holy grail skin care products. What are some of yours? Because, I'd love to branch out *evil laugh*.